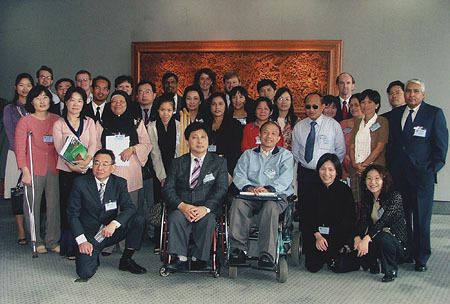 ILO (International Labour Organization) held a 3-day meeting on “Inclusion of People with Disabilities in Vocational Training” from February 14 to February 16, 2006 at the UN ESCAP Convention Center in Bangkok, Thailand. Participants of the meeting were governmental officials and representatives of corporate employer organizations as well as representatives of persons with disabilities including Mr. Topong Kulkhanchit (DPI Asia-Pacific), representatives of blind organizations from Malaysia and Thailand, and Director Ogura of WFD RSA/P. On both February 14th and 15th, a video conference was set up, connecting the Bangkok Workshop and the ILO headquarters in Geneva. Ms. Barbara Murray, ILO Senior Specialist on Disability participated in the discussion from Geneva, together with her colleagues. Unlike other ILO conferences which are normally large in scale and involving stakeholders from all sectors, this meeting was a small scale workshop for experts. Participants differed from other UN conferences on welfare and disability issues, and included representatives from employer organizations, administrators of vocational training institutes, as well as specialists from UN agencies, and representatives of organizations for persons with disabilities. There were innovative opinions from corporate employers. One of the representatives of an employers’ organization said, “We take club activities and volunteer experience into consideration when we hire new staff, as leadership and cooperation skills are often developed through such experiences. Vocational training programs for persons with disabilities should include extra curricula activities and recreation together with classroom learning. One of the main objectives of this meeting was to exchange opinions on “Draft Manual” called “Resource Guide for Inclusive Vocational Training”. This manual was written by an ILO expert in Afghanistan. Director Ogura pointed out that the manual needs to be revised in the sections related to persons with hearing disability and sign language interpreters. He emphasized that the needs of Deaf people and Hard-of-Hearing people often differ and should be considered separately. He also pointed out that the Draft Manual missed out entirely on the needs of deaf-blind persons. Such inputs from Director Ogura led ILO to promise to send the Draft Manual to each organization of persons with disabilities to ask their first-hand opinions. The manual will be published as a formal ILO document. Quick action to complete the manual is expected as the manual is already being used by several vocational training institutions. ILO plans to establish a working group to revise the Manual and Director Ogura made commitment to support the work. The participants agreed that there has been a paradigm shift of society’s understanding of towards persons with disabilities to see them as individuals with human rights rather than recipients of charity or medical treatments. However, when the discussion went in detail, some participants still made comments such as that it is impossible to include persons with intellectual disabilities or those with mental disabilities into mainstream vocational training. Director Ogura made it clear that the basic concept of UN Convention for persons with disabilities is total inclusion and that this kind of segregation would not be in line with the Convention’s aims. Director Ogura’s participation in ILO meeting, accompanied by his sign language interpreters, provided a good opportunity for ILO staff and other participants to deepen their understandings of the Deaf. Ms. Debra Perry, ILO Senior Specialist in Vocational Rehabilitation, promised to seek a way to attend the WFD RSA/P Representatives Meeting in Macao in December 2006.